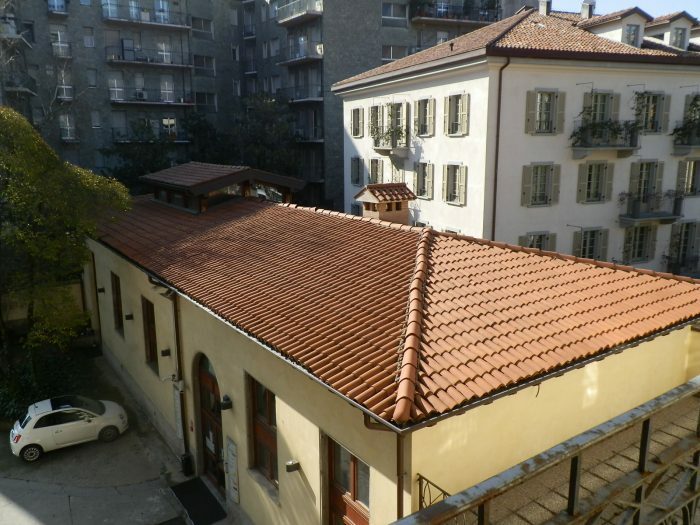 Real estate complex, built at the beginning of the 1900s, situated in a partially central zone of Bergamo. 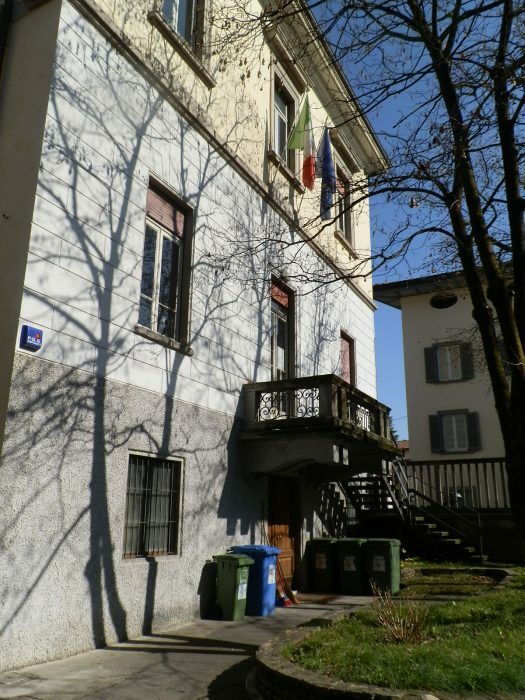 The property, made up of two buildings of diverse dimensions, is in the Pignolo quarter, in the lower part of Bergamo, not far from the entrance to Porta Sant’Agostino, that goes up to the higher part of the City, in the historical centre that is fenced by venetian walls which are part of the Unesco patrimony since 2017. 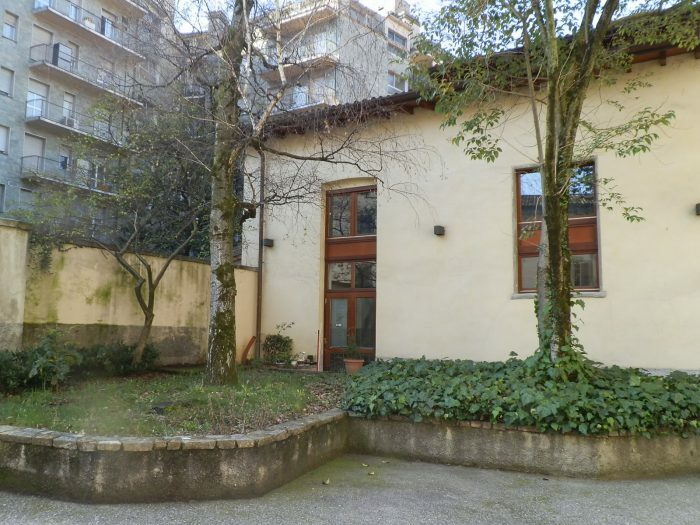 The building, at the moment occupied, is well adaptable to be transformed into a touristic and recreational facility or a private residence. 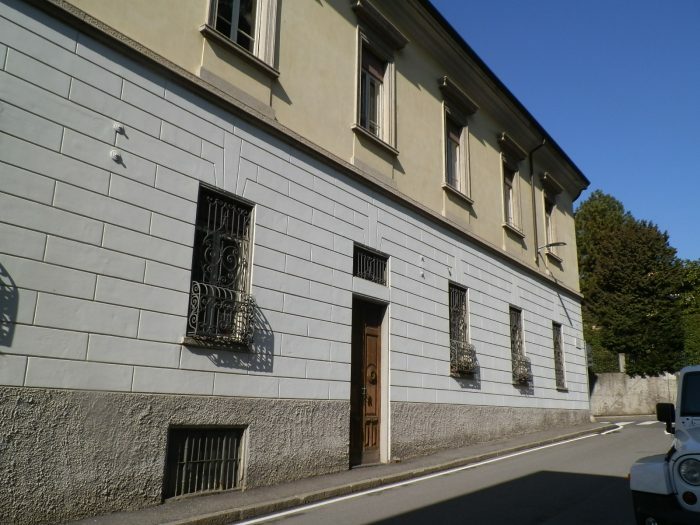 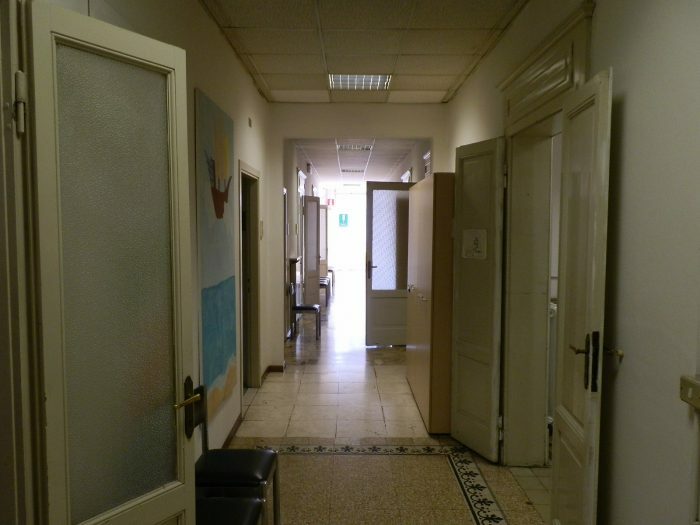 In free concession to the offices of the Educational department, now Regional Schooling Office for Lombardy – Office III – Territorial area of Bergamo, in phase of transfer to another site, the buyer cannot materially use the property until the end of the transfer to the Regional Schooling Office, which is foreseen to end by the 31/03/2019. 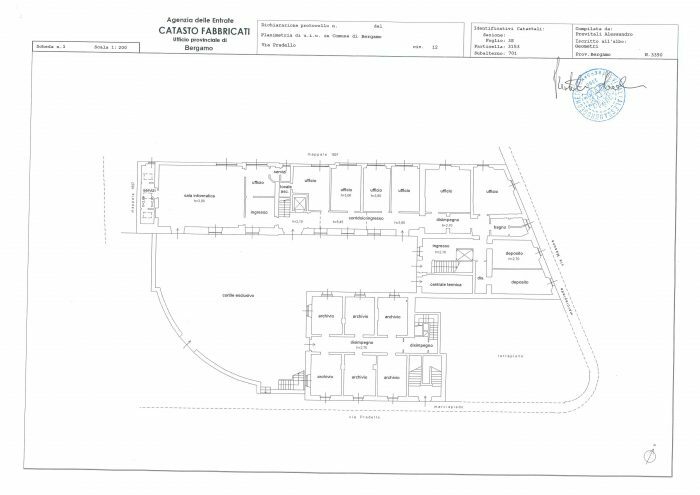 During this period, the Province will be responsible for the cost of management and ordinary and extraordinary maintenance of the building. 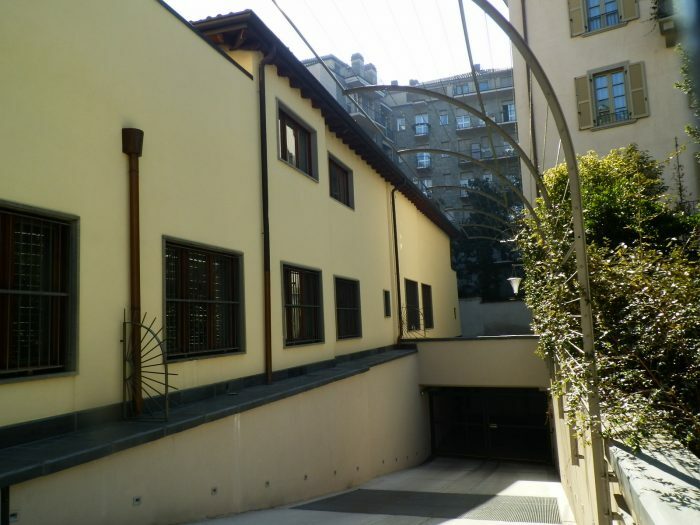 The complex, which was built at the end of the 1900s, is on an angular lot that looks onto via Pradello and via Masona, in the Pignolo quarter, characterized by the sequence of renaissance and neo-classical luxury buildings and is made up of two buildings, connected between themselves, even if distributed with different stairway areas and elevators and a courtyard of approximately 412m². 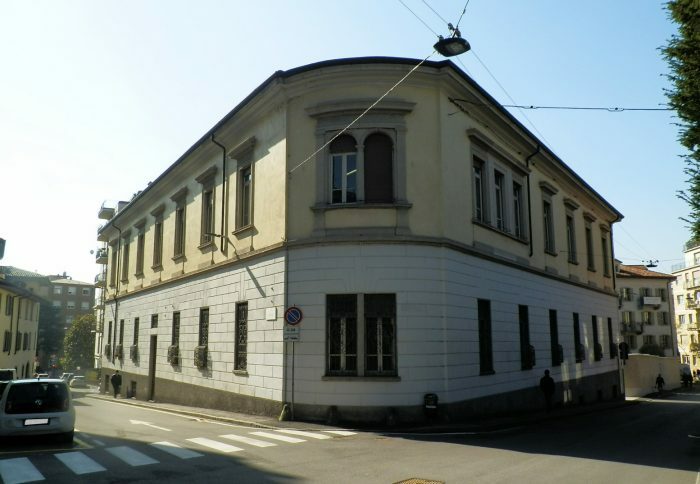 The building with an “L” shape, is articulated on three levels above the ground and is characterized by prospects with stripes of fake embossment on the ground floor, openings regularly distributed, marked with frames corresponding to the first floor, by strong vertical structures with lofts with wooden ornaments and a tiled roof. 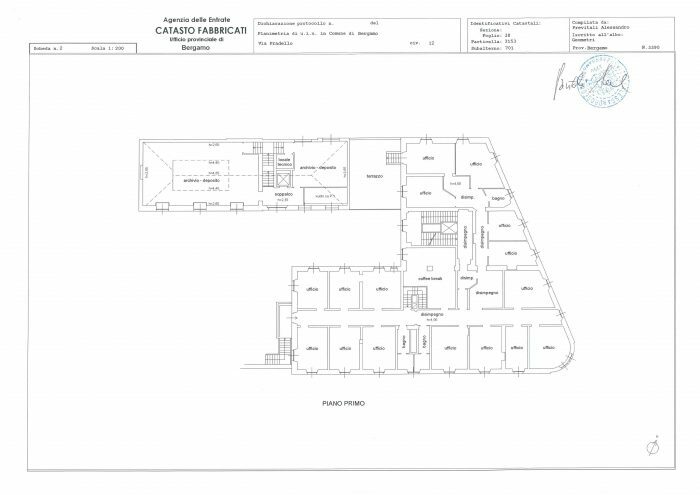 The second building, with two floors above ground, has a strong vertical structure with pillars and lofts in reinforced cement and a perimeter with internal fillings in stone and brick. 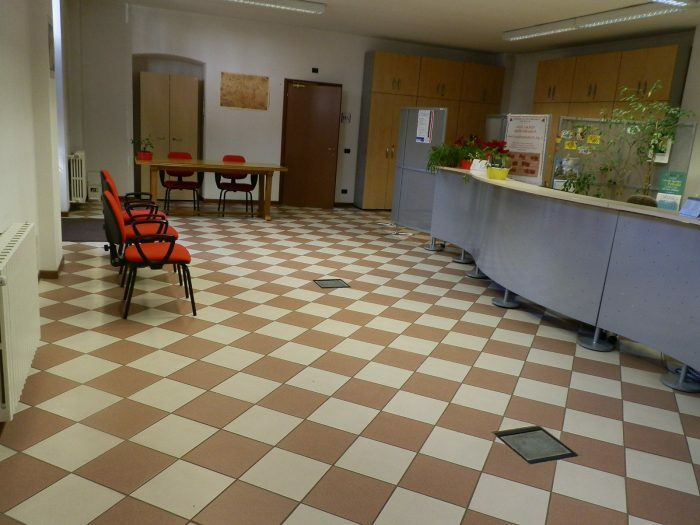 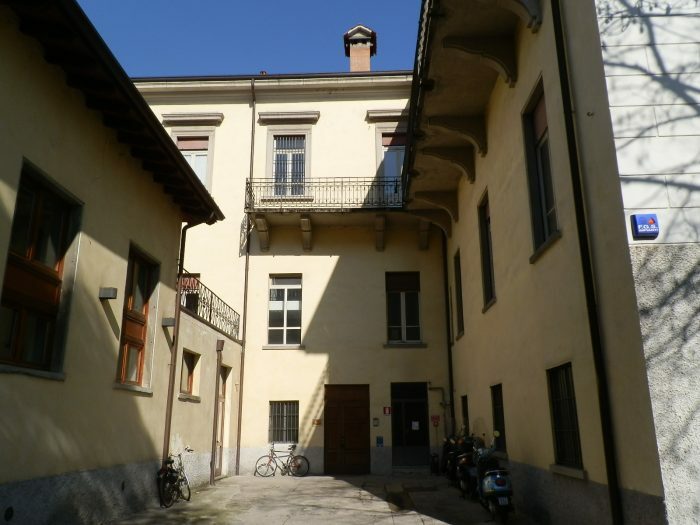 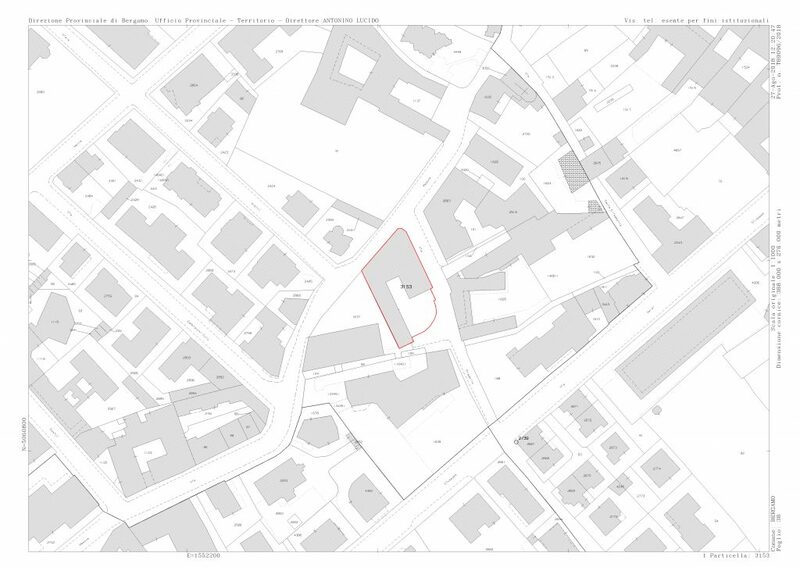 Recently, an intervention to conserve the spaces for the site of the former Education Department of Bergamo used untile 2019. 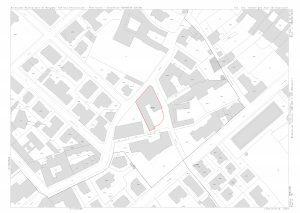 The destination foreseen by the current landscape regulation is that of residential / business and touristic – recreational use. 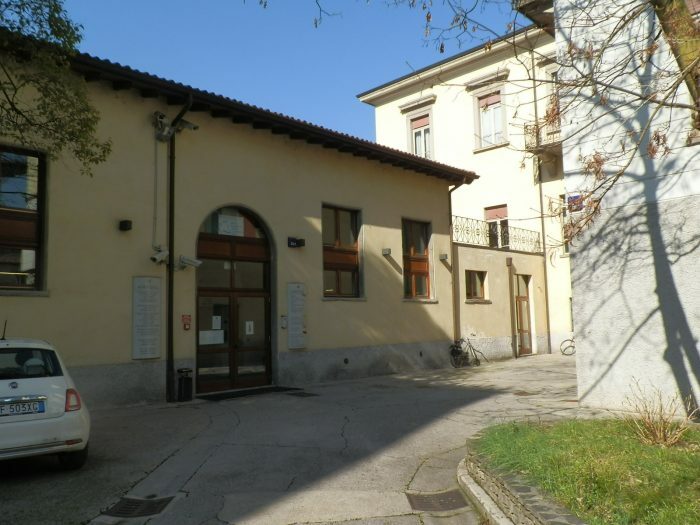 The property is built in the city of Bergamo (120,923 inhabitants), chief administrative centre of the Province with the same name (1,113,170 inhabitants), 4th Municipality of the Lombardy region for population. 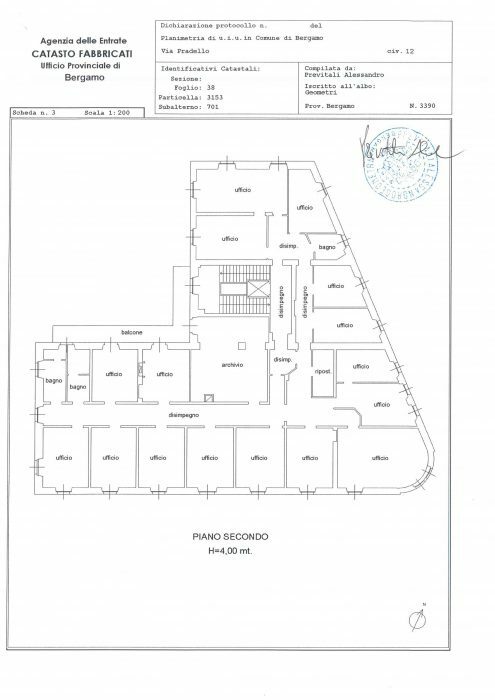 The building is in the Pignolo quarter, in the lower part of the city, close to the Port Sant’Agostino, entrance to the higher part of the city, the historical centre fenced by the venetian walls, Unesco patrimony, reachable by foot through the steps present in diverse parts of the city, by car or by funicular, that is about 800 m² from the property. 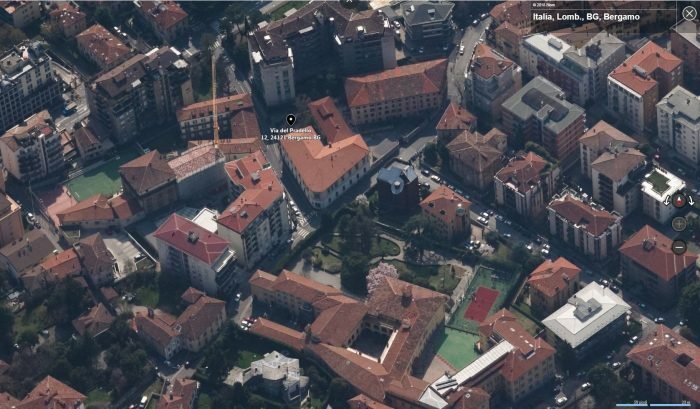 The Pignolo quarter is characterized by the presence of a high-level residential area, with many monuments and historical buildings, shops, artisans and all the public utilities. 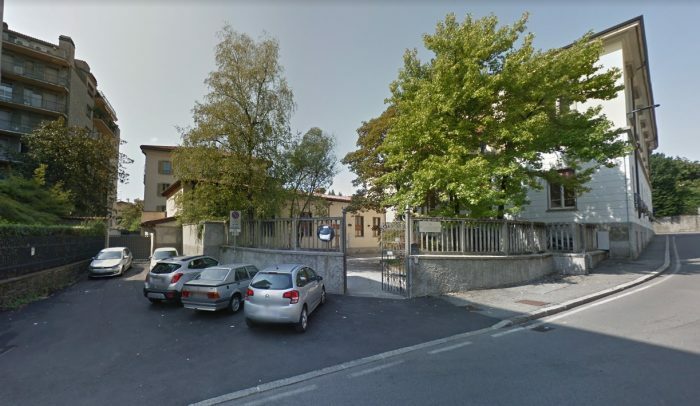 The railway station, that guarantees connections with the Province and City of Milan, Lecco, Brescia and with the airport of “Orio al Serio” (3rd Italian airport with over 12 million passengers in 2017), is1 km from the property. 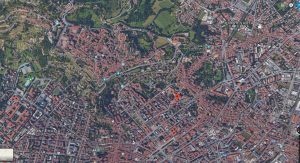 The city which is well connected to the road and freeway infrastructure, is 50 km from the centre of Milan, 40 km from Lecco (Lake of Como) and 120 km from Lugano (Svizzera).